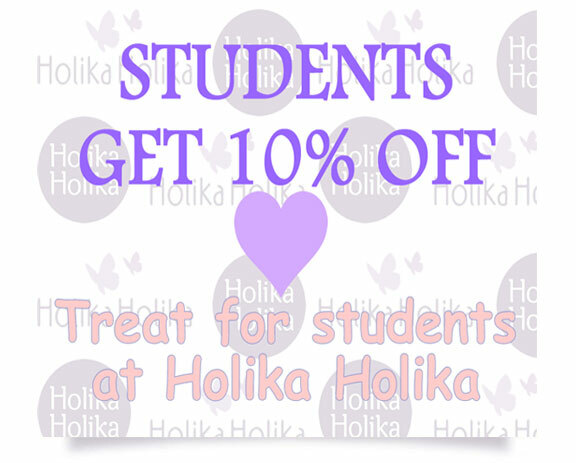 *Take 10% off your purchase when you present a valid Student ID Card. No purchase minimum, valid on full priced merchandise only. Offer valid in-store at Holika Holika Canada locations only. Offer not valid online. Offer may not be combined with any other coupons, promotions, or offers. Offer cannot be used to purchase gift cards or for returns, promotional items, sale items, or online purchases. Standard return policy procedures apply. Holilka Holika reserves the right to modify or cancel this promotion at any time.